“Oh My!” Steak Sauce: my favorite secret family recipe for the best flavored buttery steak sauce! This steak sauce is gluten free, low carb and keto approved! 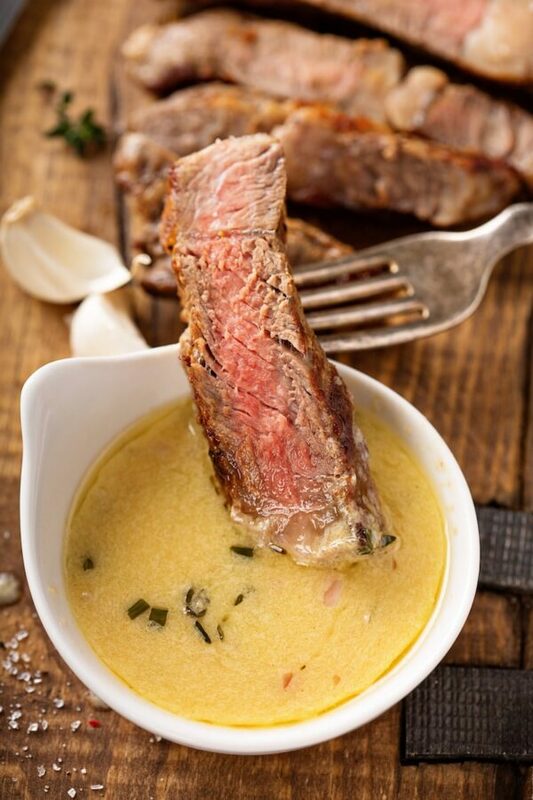 I am finally sharing the recipe for my all time favorite – insanely flavorful – steak sauce!! I know you are all probably rolling your eyes HARD at the name: “Oh My!” Steak Sauce. But I seriously could not come up with a better name that would properly describe it. With the giant range of flavorful ingredients included, it’s really hard to wrap up into an easy name that also explains what is in it. I even begged my family to help name it and this was the best we could all come up with! 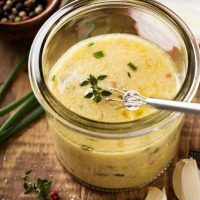 It’s a butter based sauce loaded with horseradish, dijon mustard, garlic, chives, shallot, fresh thyme, a pinch of cayenne, salt and pepper. 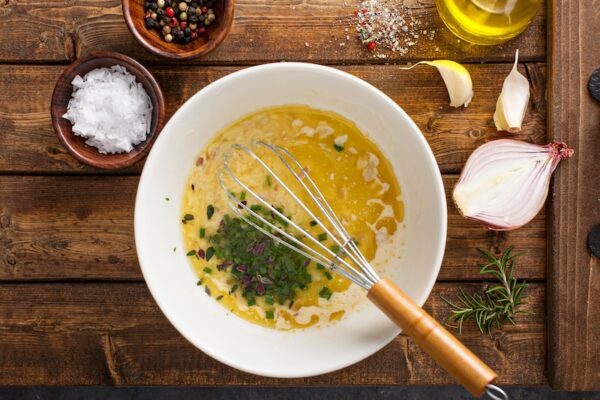 You melt the butter and quickly whisk all of the ingredients together in a bowl. THAT’S IT. It seriously couldn’t be any easier and I swear to you the flavor is phenomenal. I like to let the sauce sit for a few minutes after whisking it all together. However, that is 100% optional. If you let it sit for just 10 minutes, the butter will cool and thicken a little and then it’s PERFECTION. While I call this a steak sauce, we use it for everything. We even dip vegetables in it and roasted chicken! While we grill a lot living here in Florida during the winter, the boiling hot afternoons are on their way. During the Summer, I much prefer to cook our steak inside in a cast iron skillet in butter. Make sure your cast iron is SUPER hot before you start anything. 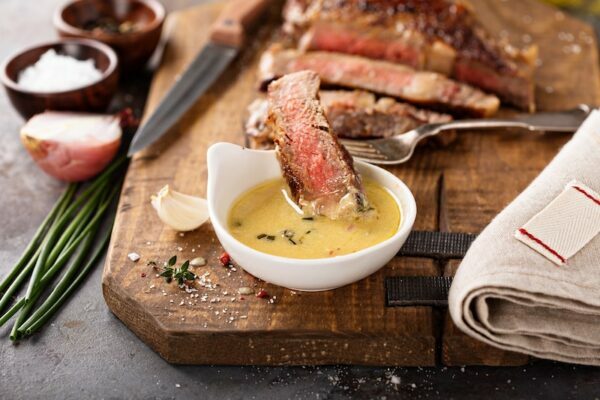 Let your steak come to room temperature before you cook it. Quickly sear the outside of the steak and then transfer to an oven preheated to 400°F to finish cooking to your desired level of doneness. LET YOUR STEAK REST. Super important. Wrap it in foil and let it rest for 5 minutes. Lastly, slice it against the grain. This helps keep the steak tender. This “Oh My!” Steak Sauce is one of my favorite family recipes and I am so excited to share it with all of you. It is so loaded with flavor and I have yet to find anyone who can resist it. Every single time we have guests over and I serve this steak sauce, they BEG for the recipe! 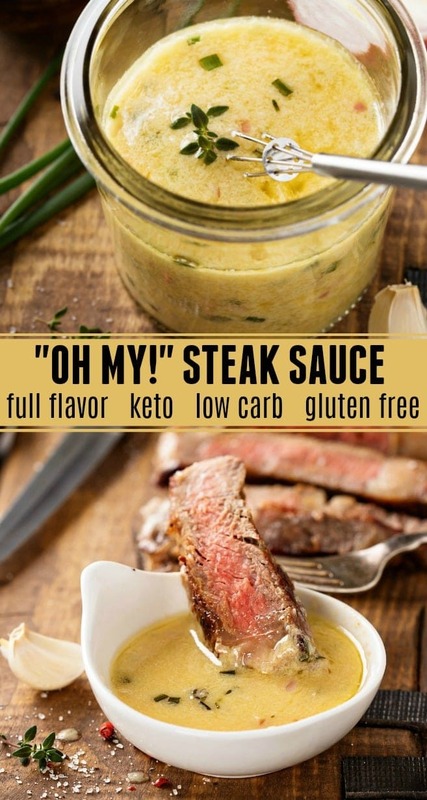 BONUS: This “Oh My” Steak Sauce is also perfect if you are on a gluten free, keto or low carb diet. Feel free to make this sauce your own. If you don’t like a certain ingredient, you can leave it out. However, I will say that this sauce is perfectly balanced as is and no ingredient overwhelms the other. I can’t wait to hear what you all think of this one! Please leave a comment sharing how it turns out when you try it! Store leftovers in the fridge and reheat in 15 second intervals, stirring often, until just melted when ready to reuse! Hmmm, this might just be the same sauce we had in this restaurant in Paris. They only serve steak n fries. I use this sauce for a baked fish dish I make. It works with almost any filets. I typically use fresh tilapia or fresh Red Snapper. Once the sauce is made and sits for 10 minutes, it’s ready. I lightly salt and pepper the fish and place them flat side (or skin side) down on a lightly oiled or buttered cookie sheet. I then brush or spoon this sauce on top of the fish. Then I sprinkle some fresh lemon juice on it. Next I cover the fish with white Panko crumbs. By now the sauce has become hard enough to make the crumbs stick. Pop it in a 350 degree oven until the fish is done and the Panko brown. Wonderful every time! That sounds fabulous, I can almost taste it through the screen! OMG I think I’m in love with this sauce!! Putting it on all the things!! What a great way to kick up the flavor a notch! My husband is a meat loving carnivore. It’ll be fun to surprise him with this addition. This sounds ah-mazing!! I’m drooling just looking at your pictures! This sauce totally deserves the name you’ve given it! It looks so incredibly delectable! I can imagine using this not just for steak but for a lot of other meat based and vegetarian recipes too! This is a must-make! I need to try it ASAP! It reminds me of a hollandaise… except no egg, horseradish, and mustard as a binder. Good recipe! I made this tonight and it was phenomenal. We just started the keto lifestyle and my husband ate keto and didnt even know it. I poured this on our veggies too like you suggested and they were amazing. I coudl drink this stuff straight! Thank you for the killer recipe. I couldn’t wait to try the sauce. Made the sauce per the recipe except for the fresh thyme I had to use 1 tsp of dried. Others obviously like it but it was not a keeper for us. 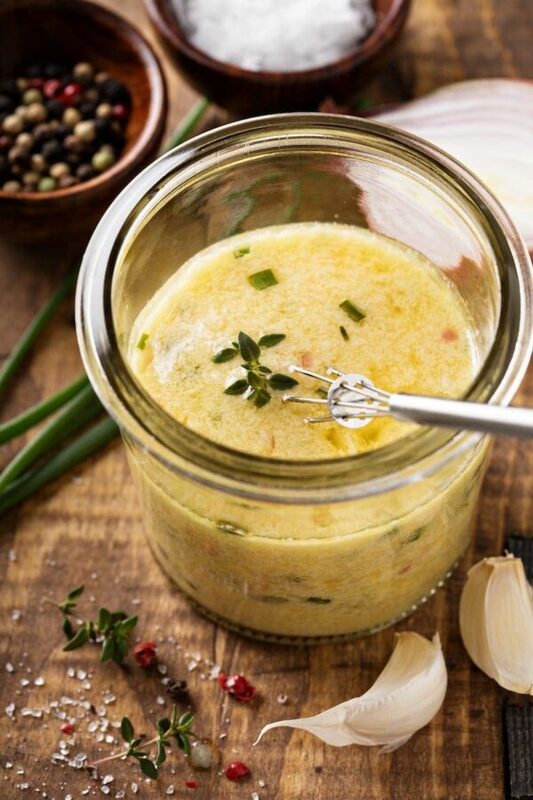 Way too many strong flavors going on with all the garlic, horseradish and Dijon mustard. Can you taste the horseradish? My hubby is not a fan and wondering if I should omit it from the recipe and will it be good without it? You can skip it, the sauce will still be flavorful! I’m not a horseradish fan either. Wondering what I could replace it with. You can skip it if you choose to! Can I use freshly grated horseradish or do you need the brininess of the bottled? This looks so much like Bearnaise sauce in the photos – which I love – and I’ll bet a bit of tarragon would get it close. Can’t wait to try it! O my goodness! This is amazing! I am looking for things to put this stuff on! Anything I can use instead of horseradish can’t buy it in Italy, don’t say Mitch it, anything else? There is no real good substitution for horseradish as it is a very specific flavor. Wasabi is made using horseradish – so you can try using it, but start with just a little and add as you taste. I am allergic to horseradish. What would you recommend as a good substitution? There is no real good substitution for horseradish as it is a very specific flavor. However, I would personally add an extra clove of garlic and maybe a pinch more of cayenne and it will still be delicious!! Capers added to this sauce is great. Adds a little bite, complements it nicely. Chives are skinny and very small compared to green onions. The bottom does not have a white tip. This sauce is awesome! Added a little tarragon and red wine vinegar and worchestire sauce for a little acid bite and used Tabasco instead of cayenne. It was a Huge Hit and I’ll definitely be making it again! Mine was super thick, like an aioli or Caesar dressing. I used the right amount of mustard but it makes it paste like not buttery. Advice? 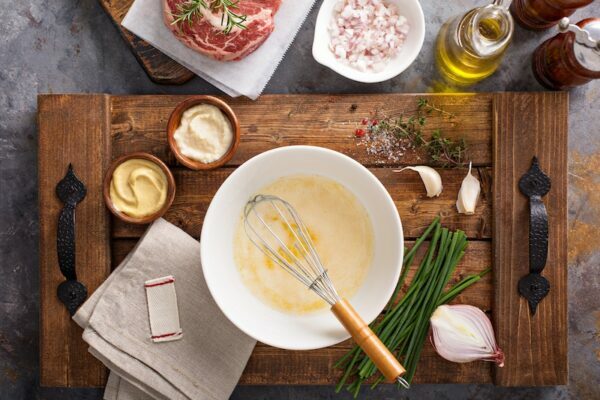 That is super strange – did you use the full amount of melted butter? 8 tablespoons/1 whole stick of butter? Oh my! I cannot wait to try this. several years back and this sounds just like what I have been looking for. I have several food allergies-garlic and dairy are two of them. Would this recipe still taste good if I left garlic out and substitute butter for Earth balance which I use as my butter substitute. Would love to try this. Thank you for your reply. Hi Catherine! I don’t have any experience with Earth balance, but if you use it regularly in place of butter I am sure it will be fine. And yes, it will still be good without garlic. You can add extra shallot to make up for it! I would double the recipe for 8 people! This was just what I was looking for !!! Hubby loves steak , but has been wanting only grass fed which is hard to find ! Well, I found some and wanted a great sauce. Thanks so much !!! Unique flavor that complimented my seared and seaoned London broil. Also was great for dipping the broccoli florets in. 1 net gram of carbs per serving. OMG, this stuff is DElicious! It was great on steak, of course – but it was equally delicious on everything on our plates. We just kept dipping everything in this sauce. Also great on a baked potato! Awesome! Love to hear that! Thanks for taking the time to come back and comment! What brand of Dijon mustard did you use? Was it coarse ground or smooth? Hi Will! I prefer to use a smoothly ground one, but both honestly work great in this recipe! Just found this. Used 1/2 stick butter, 3 tbsp horseradish mustard and a generous helping of Penzy’s Sunny Paris (a blend of shallot, chive, garlic, chervil, tarragon and basil) and thyme. It was fantastic! I used Sweet Marjoram and added some Capers. Served over sauteed shrimp and brown rice. A big hit with my guests.